The ES114 is the ultimate patch-programmable control voltage generator in the Euro-Serge system. At least two are recommended for almost every Euro-Serge system, and in most cases, a number of these are desirable. People Familiar with the previous series of "slewing" modules know about the importance of this kind of function in a large patchable synthesizer system. For those unfamiliar, it is advised that the various applications as outlined here and in the Euro-Serge Owner's Manual are studied. The uses of this module are numerous, some duplicating functions found on other synthesizers, some totally unique to the Euro-Serge system. Most systems require a number of control voltage generators to control the various signal processors and modifiers. Sources of trigger pulses (clocks), control voltage processors (portamento's), regular repeating voltages (LFO's) are standard synthesizer requirements. The USG is the main module providing these functions in the Euro-Serge system. The USG is a unity gain voltage follower with voltage controllable slopes. The range of control is exponential, extremely wide, and the Rise and Fall times can be. controlled independently. The range of the USG is from sub-sonic to high audio frequency. Trigger inputs and trigger outputs allows the USG to function as a transient (envelope) generator, pulse delay, or, in a "cycling mode" (to produce an LFO). Since the Rise and Fall times are voltage controllable, this adds another dimension to the above functions. CV IN is fully adjustable in the negative and positive direction. 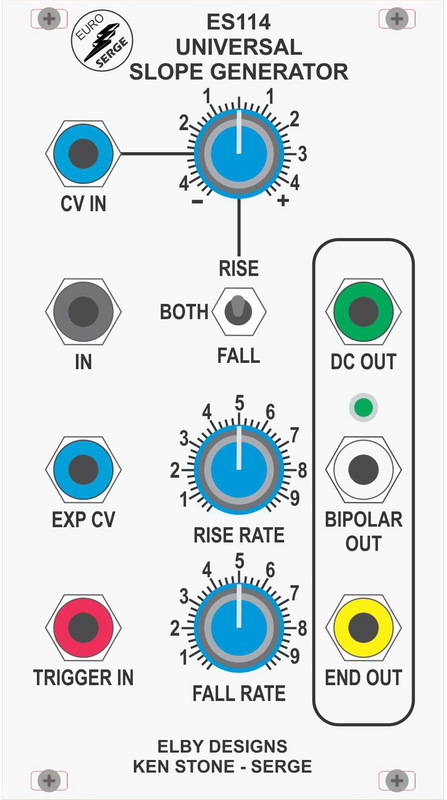 This VC input can control either the positive slope (RISE), negative slope (FALL), or BOTH. The linearity and accuracy of the slewing amplifiers allows them to be used in the mos. exacting applications, such as processing the output of a keyboard or sequencer to produce portamento functions. Note that this portamento function has a separate rate control for rising notes and falling notes, an interesting portamento effect. Patched as mentioned above, a wide-range, low-cost, space-efficient Low Frequency Oscillator can be patched when needed . The USG is often used as an LFO since-it is more cost effective than a regular oscillator switched to a low frequency range, it has a built-in LED to show its current output level, and it has a synchronized trigger output. The waveform can be set from saw to triangle, and the raising ramp can be voltage controlled independently of the falling ramp. The accuracy of these devices makes this portamento function useful with keyboards and for generating control voltages of arbitrary shapes and times with computer control. Analog control of slopes. allows the computer to do less "number crunching", and frees the processor from time-consuming routines that are more easily handled in this, low-cost multi-functional hardware . The decay rate is voltage controllable with the unigue function that under voltage control, the response may be moved from positive peak detection to negative peak detection. When the unit is triggered, it will produce an envelope set by its Rise and Fall knobs (and VC's) and then the END pulse will go high. This may be used to trigger another USG, ADSR, or advanced sequencer. If a series of triggers are applied to the TRIG IN jack that are faster than the total rise DECAY plus fall time, then the unit will divide the incoming triggers by a whole number. This allows the user to program synchronized rhythmic relationships (such as 2 against 3, 13 against 11, and so on). If the USG is set to audio 'frequencies, and the incoming RATE DELAY triggers are in the audio range, then the output will be the sub-harmonic series. This is similar to the "hard sync" sound found in other synthesizers (and is the main reason that it is not included on Serge VCOs). The range reaches 4000Hz, and the waveform has variable symmetry (saw to triangle). The slew limiting is voltage controllable so a sawtooth wave input will progressively be transformed into a triangle wave. This aspect allows the unit to be used as a low-fidelity VCF.